If anything, at least the Nats have been consistent this season. Strasburg continues to post quality starts but his team isn’t hitting behind him, much like what happened to teammate Jordan Zimmermann in the past. 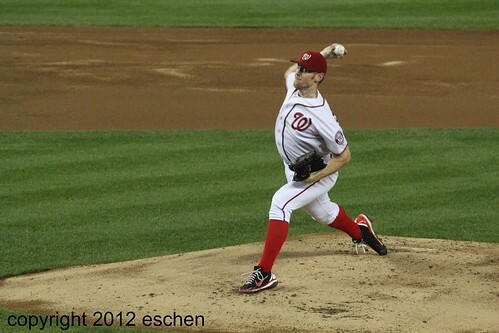 The unfortunate case is that Washington isn’t backing Strasburg up with run support. In seven innings of work on Friday, Strasburg gave up seven hits and two runs (one homerun) on 104 pitches and 71 strikes while walking one and striking out six. The Nats scored first in the bottom of the second inning against L.A. starter right-handed pitcher Ricky Nolsaco when outfielder Bryce Harper reached home on a wild pitch during short stop Ian Desmond’s at-bat in the six hole of the line-up. Some of the Nats’ collective issues for the night likely stem from a change in the batting order but with every day first baseman Adam LaRoche out for the night due to the flu, Johnson had to shift things around from what he had finally set at the end of the first half. Werth and Desmond dropped to the fifth and sixth spots respectively, Harper batted clean-up for the first time in his career while second baseman Anthony Rendon hit second, and the night’s first baseman Chad Tracy hit seventh. Los Angeles would take the lead just a half inning later in the third on a two-run homerun hit by short stop Hanley Ramirez to right-center field on the first pitch with two outs making it a 2-1 ballgame. But the real crusher of the night was the fact that the Nats had ample opportunity in the fourth inning to comeback with the bases loaded and nobody out, only they failed. Third baseman Ryan Zimmerman, Harper, and outfielder Jayson Werth all got on base but Desmond, Tracy, and catcher Wilson Ramos couldn’t tally an RBI. Washington would come back to tie it up in the sixth inning when Zimmerman scored on a RBI single hit by Desmond but the runs stopped there. Reliever Tyler Clippard threw a spectacular and dominant eighth inning. He faced three and struck out two. It was closer Rafael Soriano who let the game get away from Washington. Soriano gave up a leadoff homerun to right field to L.A. center fielder Andre Ethier making it a 3-2 game that Washington couldn’t win. The Nationals (48-48) fell to third place in the National League East division after the Philadelphia Phillies beat the New York Mets last night. good piece, getting better all the time. Keep it up.